It was a dark and stormy night. No, actually, it was a heat wave. We took refuge in the Keyboard Maestro forum where we like to read other people's problems. For a change. I do a lot of processing of digital images in an app (DxO Optics Pro 11) which has a selection of Presets that can be selected by clicking on a button which opens up a Preset selection window. I would like to assign a keystroke to each frequently used Preset. I do not know whether or not this is possible but any help would be most appreciated. 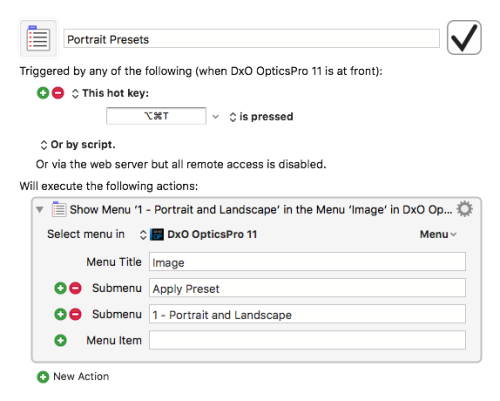 DxO Optics Pro is not scriptable. It does, on the other hand, have a pretty efficient user interface. You want a grid overlay, type G. You want it to disappear. Type G. It toggles. But for more elaborate options -- like presets -- you have to resort to the menu system, pulling down options that fly out to the right until you get to your choice. Optics Pro Presets. They're all accessed via the menu system but show a nice preview of each effect. 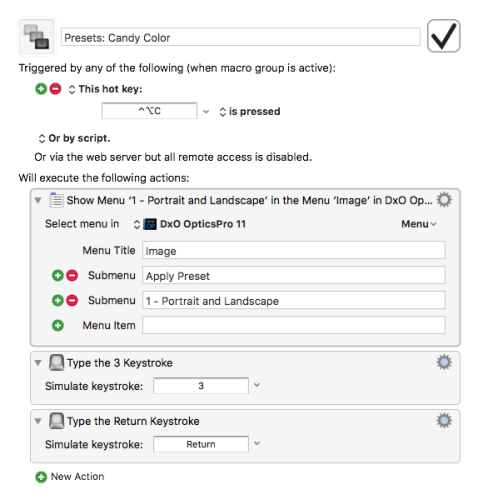 Keyboard Maestro can chase those menus for you. Up to a point anyway. To solve Allsop's challenge, we decided to use the menu system. 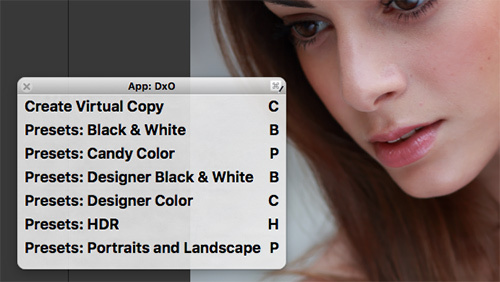 DxO Optics Pro's Image menu holds the Apply Preset option that flies out to another menu that lists the presets by name. 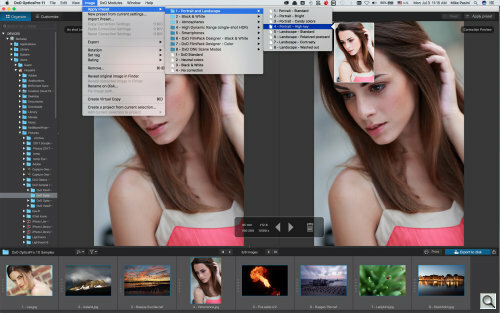 When you hover the mouse over a preset, Optics Pro displays a large thumbnail of the effect on the current image. So it's kind of fun to arrow down through your options before selecting one. To do that in our macro, we simply left the last Menu Item field blank. When we run the macro, it flys the proper menu out and we can arrow around until we see something we like. But the challenge seemed to suggest that Allsop already knew which preset he wanted to apply. To do that, we tried adding the preset name to the blank Menu Item, but it failed. No problem. We just tacked on a couple of keystrokes to the macro to make the final selection. To actually run the macros, you trigger it in any number of ways. You can use a hot key (or chord) like ⌃⌥B for Black and White presets. But you'll no doubt have more than one and can quickly run out of clever key combinations you'll remember. So we tend to use the same hot key trigger. You might, for example, use ⌃⌥P for Presets. Easy to remember. Keyboard Maestro displays a conflict palette listing all the macros with the same trigger so you can select which one you want. But that palette can be formalized into a DxO Optics palette you can display with a hot key trigger. That, in fact, is what we prefer to do. We have a few application-specific palettes as well as task-specific palettes that run in multiple applications as well as global palettes that run all the time. We created a palette that would run only in DxO Optics Pro so the triggers would not conflict anywhere else. 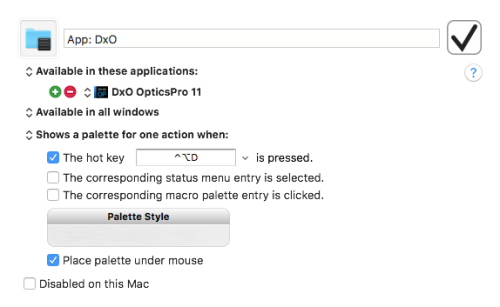 We launched the palette under the mouse with the trigger ⌃⌥D for DxO. Each macro on the palette has its own one-character hot key trigger. Optics Pro offers two fly outs for black-and-white presets so we assigned the same trigger B to them so a conflict menu lets us narrow it down. Optics Pro Palette. Each item is a macro with its own trigger. So to apply the Candy Color preset, for example, we hit ⌃⌥D and then P. To get the Designer Color presets to display with a preview, we hit ⌃⌥D and then C.
If this intrigues you, you can download our basic palette with sample macros (completing the palette is an exercise left to the reader). You do need Keyboard Maestro to run it, though. Allsop gave it a whirl and reported back. "Thank you so much for this." Mike, this is a link to the post I have made on the DxO board http://forum.dxo.com/index.php?topic=13443.new#new1. Thanks once again.